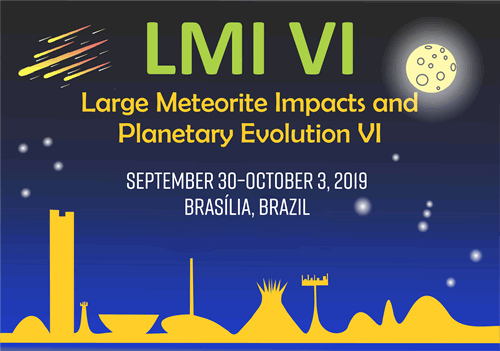 We are happy to announce the Large Meteorite Impacts and Planetary Evolution VI conference scheduled for September 30–October 3, 2019 at the University of Brasília, Brasília, Brazil. The process of impact cratering, its planetary effects, and its environmental implications have been the subject of five previous Large Meteorite Impacts and Planetary Evolution conferences. These previous conferences took place, respectively, in Sudbury, Canada (1992, 1997 and 2013); Nördlingen, Germany (2003); and in the Vredefort Dome in South Africa (2008). Note that the LMI in 2019 will be held for the first time in South America. Since LMI IV, several major international drilling and field projects on terrestrial impact structures, as well as new spacecraft missions to the Moon, neighboring planets, asteroids, and comets, have delivered important new insights into cratering processes within the solar system. LMI VI will provide a forum for discussion of recent results and advances, based on natural observations, spacecraft data, experimental results, and numerical simulation studies. LMI VI will also provide a forum for discussion of pertinent advances in multidisciplinary research on planetary and terrestrial impact cratering, and the effects of this process on target rocks and minerals, as well as its environmental consequences. Remote sensing, geophysical and numerical modeling, geological, geochronological, mineralogical and geochemical, and astrobiological results and implications will be discussed. In addition, the future of impact cratering research, in the broadest sense, will be evaluated. Is There Scope for Further Impact Cratering Studies? Quo Vadis?